679x479 10.8 kb "A Day at the Beach" - Foxglove and the Rescue Rangers enjoy a sunny day off at the beach. 679x479 47.7 kb My (ahem) attempt at coloring Jeff Pierce's wonderful "A Day at the Beach" picture. Wonder if he'll ever let me do this again :}. 610x791 197 kb A very colorful tapestry featuring various characters from "Good Times, Bat Times" as well as scenes from popular Foxglove fanfics such as "Consummation" and "Wolfsbane". 597x777 94.2kb A lovely portrait of Foxglove and Dale's daughter, Magnolia. She cuddles in her father's hawaiian shirt, while draped in flowers that bear her namesake. 597x777 80 kb The curvy and sultry Wolfsbane,Foxglove's Vampiric alter-ego from Glenn S. Byrnes fanfic, "Wolfsbane". Dale could hardly keep himself from falling for this tempting mistress. ;). 605x779 112.5 kb Morcego from Glenn S. Bryne's fanfic, "Wolfsbane", strikes a handsome pose. 630x811 34.6 kb I'm sure the Bat Conservation International would love to have this logo Charles did for their organization ^^. 588x772 50.8 kb "Rootn' Tootn' Foxy!" This pretty cowgirl playfully tips her hat to you. 624x800 93.5 kb "The Green Hornette" Foxy as the classic TV crimefighter, "The Green Hornet". Hey, Dale could play the as the karate-kicking chauffer ^^. 624x800 51.6 kb Foxglove models as a cute cyber-bot. 624x800 92.8 kb Foxy's got "Flower Power"! ^^. She gives you the "peace" sign. 573x733 72.4 kb Foxy really is a shy 'lil bookworm when she's not around Dale. Here, she represents her alma mater: Bat State University. 443x576 69.6 kb Foxglove wraps her wings around a very brave Dale as they traverse a dark alleyway. Inspired by the story "Plots" by Matt Plotecher. 320x418 54.8 kb Dale, cool as ice, takes in the tropic nightclub scene. Foxglove poses with passionate eyes that could easily melt his cold stare. Inspired by the poem, "Havana Tango", by GCU. 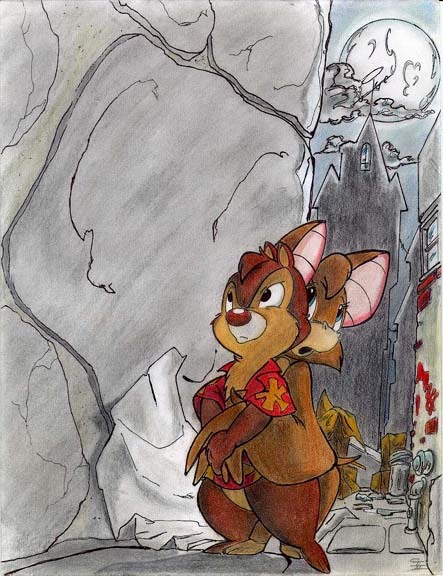 325x422 32.2 kb Ms. Brisby from "Secret of NIMH" and Foxy share a lighthearted conversation. 315x378 14.2 kb Here's a portrait of the saddle-blazin' prarie bat, Uncle Bevidere Fairmont! He's part of Foxglove's Family Tree. 286x366 23.9 kb Sagramore Fayermounte poses upon the pages of his favorite book. He is the first member of Foxglove's Family tTree. 286x378 18.1 kb "Sir" Sedricke Fairmounte stands as a proud member of "Warrior Bat of Worchester". He is also part of Foxglove's Family Tree. 426x500 34.5 kb Foxglove, with pretty blue eyes,flirts with the viewer. She's set in a clever backdrop showing a bat of both the night and day.